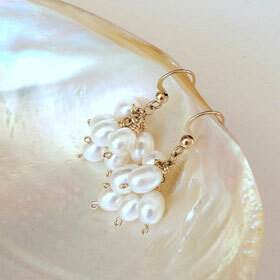 Sweet bunch of pearl 'grapes' in these high-grade pearl earrings, exquisitely and meticulously handwired with 14ct goldfill. Team with the Toscana pendant for an elegant gift set, or for your wedding jewellery. Made to order please allow a few days. Length: 35mm overall. 14ct goldfill hooks. Options: contact sales@kyrenedesigns.com for with pink or 'peacock' black pearls, or with tarnish-resistant argentium silver for easy care.